Truckee, California – October 1, 2018 – The Ice Axe Foundation is proud to announce the launch of the Ice Axe Impact School, an educational platform formed to facilitate transformational experiences for students and active learners across the globe. The Ice Axe Impact School has been many years in the making and was founded by Douglas Stoup, one of the world’s foremost polar explorers. 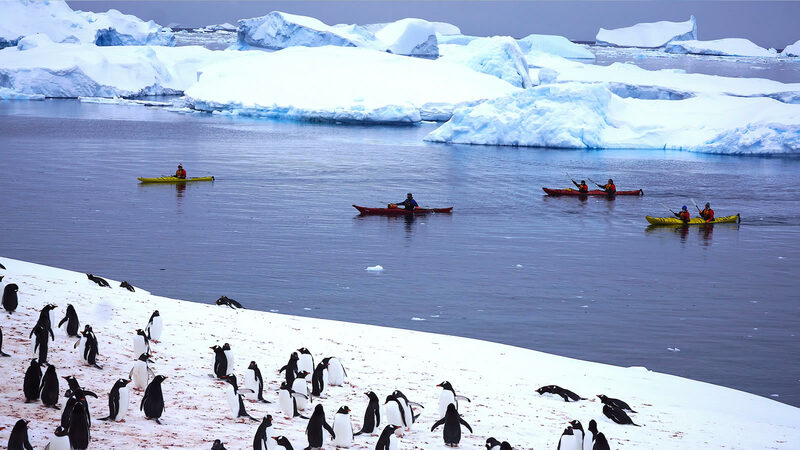 Over his decades and numerous expeditions in the field to both the North and South Poles, as well as other remote locales, Stoup has experienced first-hand the impacts of climate change. Armed with knowledge of the compromised ecological integrity of the planet, he wanted to make more of a difference. The Ice Axe Impact School was born out of this commitment to addressing climate change and creating a better future. “Making unique learning opportunities available to youth is one way to cultivate active citizenry for the next generation of global problem solvers. We need all the help we can get, and I know the more people experience our beautiful planet the more they will want to protect it,” says Stoup. Douglas has partnered with global expedition guide and educator, Brennan Lagasse to lead the Ice Axe Impact School. Lagasse has taught at the high school and collegiate levels, imparting his students with a holistic understanding of sustainability that intersects political, economic, social, cultural and environmental issues. Lagasse has focused his doctoral studies on contributing to the movement to protect the Arctic National Wildlife Refuge as well as bridging the expeditionary nature of mountain guiding with the experiential aspects of transformational education. He has led field courses with students to diverse parts of the world and has committed his skills to the Ice Axe Impact School as the Lead Educator, building a series of dynamic core courses, including an adaptable platform that caters to a diversity of learners across age, ability, and interest. “As both a student and teacher within higher education, colleagues and I have theorized how to change the world for the better for years. I believe education is a necessary part of the journey, and the creation of this school is taking that dream from an idea to a reality,” says Lagasse. The Ice Axe Impact School will formally launch operations this October with an expeditionary, experiential field course to the Brazilian Amazon to work with members of the local Desano tribe. Other courses set for 2018-2019, all of which leverage long-term relationships with place-based people in extraordinary environments, include Antarctica, Greenland, the Arctic National Wildlife Refuge, the California Redwoods, Bhutan, and the Sierra Nevada Mountain Range. There will also be a lobbying trip to Capitol Hill in Washington, D.C. The Ice Axe Impact School will also offer customized educational experiences that can be tailored to students in high school, college, or those who are simply looking for an out-of-the-box learning adventure. For more information about the Ice Axe Impact School visit www.iceaxeimpactschool.org or contact Lead Educator Brennan Lagasse at brennan@iceaxe.org.